There are increasing problems arising from the widespread availability of cheap and high power hand-held laser pointers, particularly in the transportation industry where operating staff in aircraft, trains or even buses may require eye protection devices in order to avoid being dazzled or even suffering eye damage. Iridian has introduced laser reflection eye glasses, LaseReflect, designed to reflect common laser lines. The reflection (blocking) bands are quite narrow so the overall light transmittance remains high (> 80%, important for night-time use) and the impact on color balance is minimized. The charts below show the linear transmittance and the optical density (OD) of LaseReflect glasses. The reflectance is greater than 99% at these laser wavelengths over angles of incidence of ± 35 degrees. These glasses also provide excellent UVA and UVB blocking and provide a very good overall color balance with luminance transmittance of 0.56. Notice: Light of other wavelengths WILL BE transmitted so there is no protection at other laser pointer wavelengths. A laser beam reflected off the glasses will be diffused over a range of angles so that the reflected laser beam intensity will be reduced after a few meters; however, it may still be intense close to the wearer of the glasses especially for high laser powers. These glasses are not intended as safety glasses for use with high-power lasers in a laboratory or industrial environment. Do NOT test the laser reflection eye glasses with ANY laser pointer pointed at the glasses while wearing them as the laser pointer wavelength may not be one of the wavelengths that are blocked! 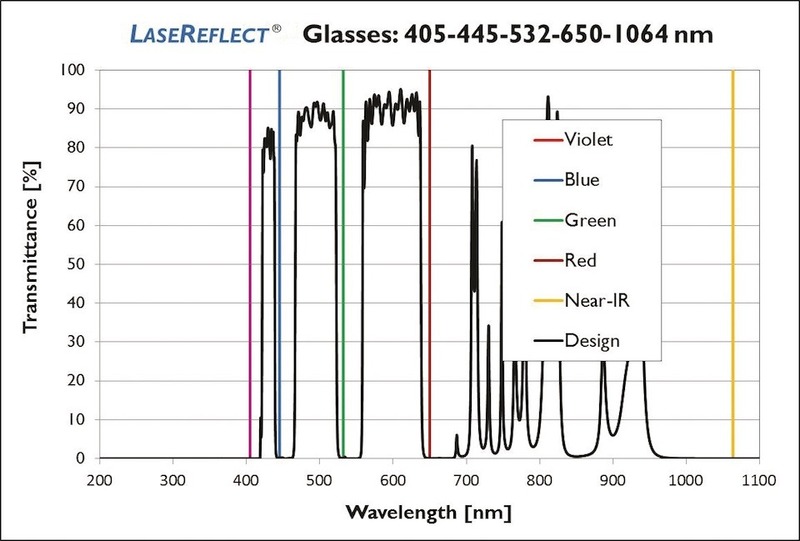 The LaseReflect glasses can be optimized to reflect different laser pointer wavelengths than those specified above. 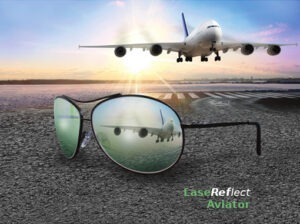 LaseReflect glasses designed to protect against the most common threat (green/near-IR) are available as stock products.